Three posts in one day? What is going on? The answer is, EVERYTHING! It’s summer in Myrtle Beach and the family fun opportunities are coming at me from every direction. Today’s hot ticket is Monster Jam! Tonight and tomorrow (June 9th and 10th) at the Myrtle Beach Speedway you can get your fill of everything monster trucks. That’s right…those gigantic tires are rolling in and Monster Jam will go down! Shows start at 7:30 PM, with a pit party tomorrow (Friday) from 4:30-6:00 PM. Tickets start at $15 for adults and $10 for children ages 2-12. Click here for more details and to purchase tickets. Tickets are also available at the gate. Want a preview? 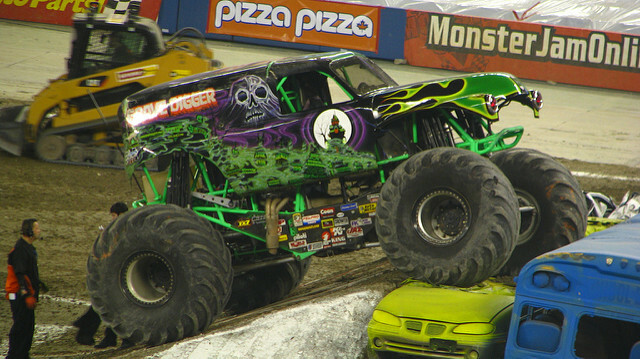 Check out the plethora of Monster Jam videos on YouTube.